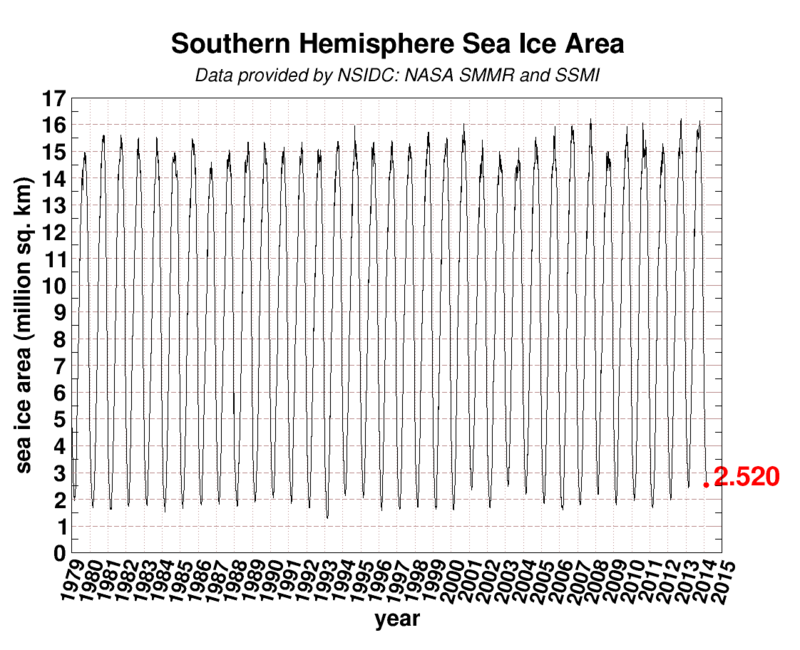 Southern Sea Ice Area Minimum 2nd Highest on Record | Watts Up With That? Just heard a lady in Ohio say that the ground around her home is frozen to a depth of 8 feet. She can say so but I think not. Lots of ice and cold though. Nice post Mr. Facts. Nice post by the way. I enjoyed it. I make the minimum 4th highest, not 3rd. 2008 came in at 3.691, and is the highest. BTW – The Aurora Australis has had ice problems YET AGAIN. Emergency supplies will now have to be airlifted by helicopter. 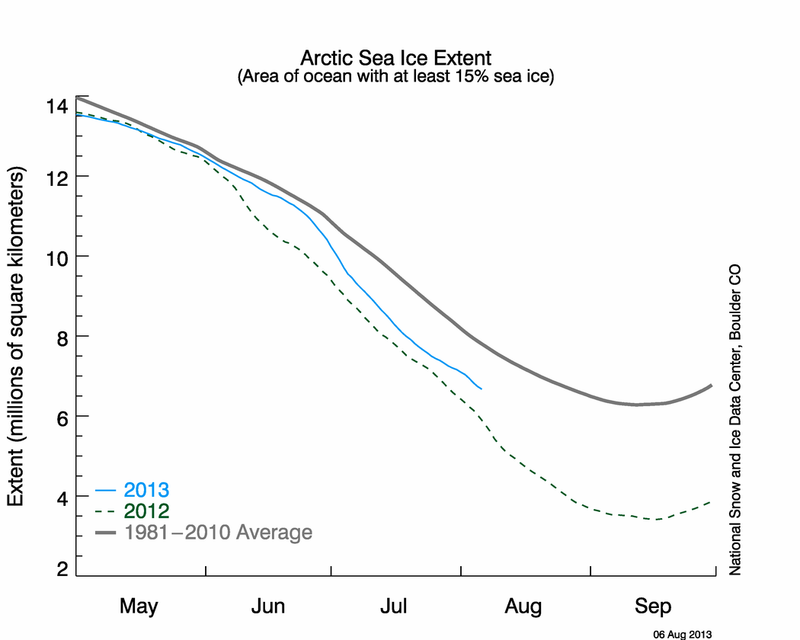 So Antartic sea ice extent is constant, Arctic one is shrinking, leading to a smaller sea ice extend in global terms. So I’m wondering about the sentence, “Global Sea Ice Area has remained stubbornly average over the year”, while in the same sentence it is said that “Global Sea Ice Area Anomaly is currently .361 Million Sq km below the 1981 – 2010 average:”. How does that make sense? You are absolutely correct, my mistake. I have corrected this error in the article above and linked the correction to this comment. Thank you very much for correcting this mistake. No, Antarctic ice is not constant. It has been at record levels for most of the last year, and at the end of Feb is 23% above average. Meanwhile global sea ice , while slightly below normal this month, has also been above average for most of the last year. Antarcic has remained “constantly above average”, not “constant”, and Arctic has grown this year,but is still below average. Between the two they’ve given a global extent that’s been bouncing around the average mark since about the begining of 2013. 0.361 million sq km below average may sound a lot, but it’s so close to the average as makes no difference – a couple of months ago it was a full million above average, about 6 months ago it was about the same as now, and for the 6 months before that it was between average and about 0.8 million above. So it’s “remained stubbornly average” – neither surprisingly high nor low. Hope that helps clarify it? :). 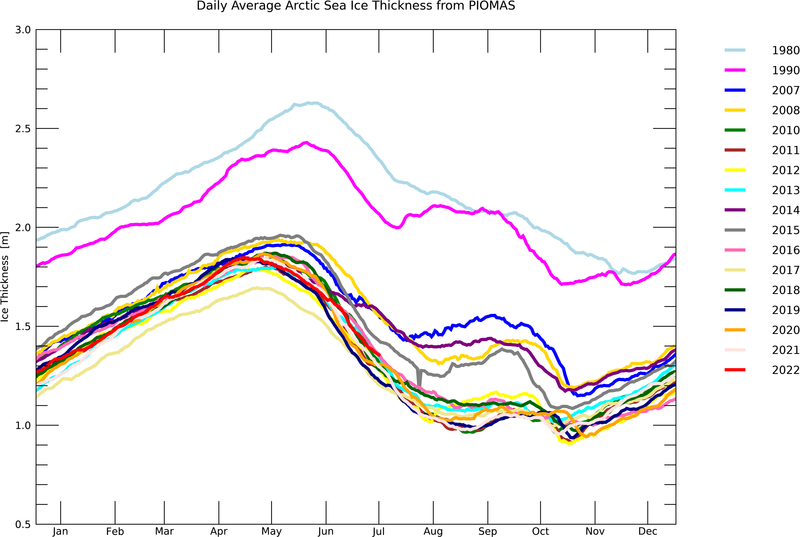 Eyeballing your first chart, it looks like the most recent Antarctic sea ice maximum (2013) was the third highest. So within one year the min and max where both the third highest. So Antarctic sea ice extent is constant, Arctic one is shrinking, leading to a smaller sea ice extend in global terms. So I’m wondering about the sentence, “Global Sea Ice Area has remained stubbornly average over the year”, while in the same sentence it is said that “Global Sea Ice Area Anomaly is currently .361 Million Sq km below the 1981 – 2010 average:”. How does that make sense? I am giving an educated guess here. I wonder if the record extents have to do with the position of the cold pools (there are two) related to the Circumpolar Wave and the shoreline geography of Antarctica. Food for thought. I think anyone with an unbiased view would have to observe that the two poles are doing something wildly different when it comes to sea ice. A straight inter comparison is hardly worth the effort. Artic ice changes by approximately 7 million sq km between summer and winter whilst Antarctic ice swings by some 13 million sq km. this most likely has something to do with the presence of land in the Antarctic and the lack of land in the Artic. I suggest this because I have noted a fairly regular cadence to the peaks in the above extent graph that appear to match the circumpolar wave. I wonder if there is a fit somewhere. Global Sea Ice extent is about 2% below normal. That’s not much of an anomaly. Lovely! I received the most wonderful bouquet of deep red roses and dinner out. Plus a semi-precious stone strand necklace. That man treats me like a queen and is the kindest person I have ever known. I am indeed very fortunate! Given co2ers don’t seem to have designed a fail point in their experiments then there is no point at which evidence will change their conviction that the theory is right. Co2 =main driver of climate is a Hotel California. You can check out any time u like but u can never leave. 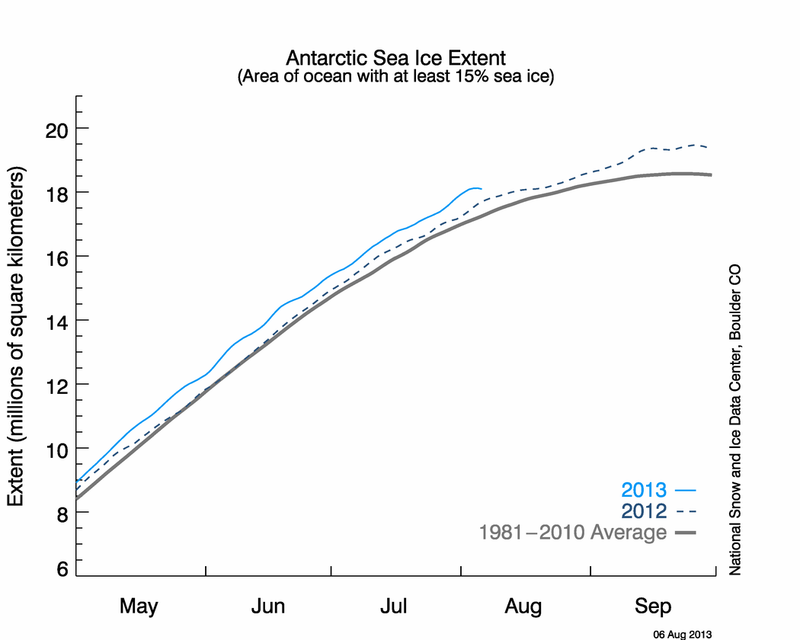 October, 2013, the Antarctic sea ice extents was at a record high maximum at right at 19.5 Million square kilometers. The Antarctic sea ice extents ANOMALY in October 2013 was also very high – over 1.5 Mkm^2 of “excess” southern sea ice extents. ALL of this “excess” sea ice was between latitude 60 south and latitude 59 south. ALL of this “excess” southern sea ice extents covered an area LARGER than the entire area of Hudson Bay (also centered at latitude 60), and this EXCESS southern sea covered an area about HALF the size of Greenland (a region centered between 60 north and 80 north latitude). The CAGW deists ignored it. Totally. Absolutely ZERO coverage in the world’s press. And, to be honest, very little coverage in even the “friendly” web environment also. Some notice, but no press releases nor TV appearances, right? But, when the southern hemisphere “gains” 1/2 Greenland sea ice extents? Just remember, at today’s sea ice extents, the “edge” of the Arctic sea is a tiny ring about latitude 78 -82 north in mid-September. The “edge” of Antarctic’s sea ice minimum is also a “ring” – but that ring is about latitude 66 south. Much closer to the equator, much more energy reflected from the Antarctic sea ice, right? Now, at maximum extents, the “edge” Arctic sea ice is at its closest point to the equator is only down to 72 north, not even as close to the equator as the minimum Antarctic sea ice! But at its maximum, Antarctic sea ice extents is much, much higher at 59.2 to 59.0 latitude. Closer to the equator than even the most southern tip of Greenland! Now, at the equinoxes, when both Arctic and Antarctic are both hit by the same solar intensity, the Antarctic Sea Ice receives between 2x (Feb-March) to 5x (September-October) the energy that the Arctic sea ice receives. Thus, to reflect equal energy into space, the “gain” of even 1.0 Mkm^2 of southern sea ice extents needs to be balanced by a loss 2 to 5 LARGER in the Arctic. Instead, we see near even sea ice changes. So, since at today’s levels of sea ice extents, “more Arctic sea ice loss” up north means a net loss of energy from the planet; and “more sea ice extents gain” down south means a net loss of energy from the planet, we are facing a future big problem. If today’s trends continue. And, as we can always predict, if today’s rates of Antarctic sea ice extents gain continue, the sea route around Cape Horn will be blocked to shipping within 8-10 years! P.Homewood says 4th highest instead of 3rd; You (justthefacts) agree; post title still says 2nd highest; what gives? Muchly puzzled? As the climate warms, snow cover and sea ice extent decrease; glaciers and ice caps lose mass owing to a dominance of summer melting over winter precipitation increases. This contributes to sea level rise as documented for the previous generation of models in the TAR. There is a projected reduction of sea ice in the 21st century in both the Arctic and Antarctic with a rather large range of model responses. The projected reduction is accelerated in the Arctic, where some models project summer sea ice cover to disappear entirely in the high-emission A2 scenario in the latter part of the 21st century. Widespread increases in thaw depth over much of the permafrost regions are projected to occur in response to warming over the next century. The take home messages is that while the increase in total Antarctic sea ice area is relatively minor compared to the Arctic, it masks the fact that some regions are in strong decline. Given the complex interactions of winds and currents driving patterns of sea ice variability and change in the Southern Ocean climate system, [b]this is not unexpected[/b]. oh, these guys are a laugh a minute. here sit down story, i have a nice massage for you. of course ar5 used the cut and trim method, proven to work ten times better because it wont come back to bit you in the future. AR6 will be …sea ice.. what is sea ice, we only talk about sea level rise, and that is all we have ever talked about! Good observation, F. Ross (3/1/14, 5:04pm). Regardless, even if Sea Ice Area might underestimate areas of ice with surface melt, the measurement process has been applied consistently throughout the record and 2014 had the 2nd highest minimum. It seems the co2ers have mutated their argument to deal with the fact all their predictions are wrong. Eliminate the need for predictions! Hijack the actual as ‘proof’. Then there is no need to recognise when their hypothesis has failed. It can never fail. Whatever the actual does =driven by co2. get out of that one Houdini! Does this mean that Australia, South Africa and New Zealand will get a colder winter in 2014 than they got in 2013? You may be onto something there. :=) Will await JTF ruling. the measurement process has been applied consistently throughout the record..
JTF…are you sure about that? I remember NSIDC doing at least two changes and one fairly recent……. What has gone largely unreported even in the skeptical blogs is that major shipping companies are very worried that the passage around Cape Horn will be blocked. Modern giant container ships cannot get through even the expanded Panama Canal. Such a blockage would disrupt world wide shipping severely. Please! Keep your sea ice extents (covered by at least 15% sea ice) and sea ice areas (areas completely covered) separate. Well, the last glaciation froze half the northern hemisphere. The upcoming one looks to return the favor to the southern half of the planet. Thank you for your cogent, if dificult – for me, anyway- explanation. I freely admit that old age has not improved my reading skills – or typnig ethere. In truth, we don’t know. The “excess” sea ice extents around Antarctica DO significantly affect the southern region’s climate, if the commonly accepted climate theory of solar energy absorbed and solar energy reflected is true. The Antarctic continental ice (14.0 Mkm^2) + Antarctic permanent ice shelves (3.5 Mkm^2) + the variable Antarctic sea ice itself (3.5 Mkm^2 to 19.5 Mkm^2) all combine to cover an area larger than the entire southern hemisphere continental land area combined! This Antarctic total ice cap covers the region from the south pole “up” latitude 59.2 south in September – a latitude closer to the equator than even Greenland southern tip. But, on the common Mercator maps, it is not even plotted! But, it reflects much more energy on a square-meter-by-square meter basis, than the Arctic sea ice “beanie” – which is limited to the little area between the north pole and latitude 72 north at most southern points near the Alaskan and Siberian coasts. So, the impact of the Antarctic sea ice is much greater than that of the arctic sea ice on any given comparable date across the solar year. @ F. Ross — I was TOTALLY wrong. LOL. (thanks for the friendly wave of the hand, though) JTF gets an “A” for facts, but a C for writing style, I’m afraid. And I get a C for reading — I just get so BORED with the content that I skim (oops!). Every word is potentially significant. Sigh. Highlighting and underlining (etc…) would sure help the communication though. WUWT needs a writing style editor… . Oh, and F. Ross — I can tell you (re: reading carefully) from personal experience that it is NOT old age. So what Climate doom do we face? Fire or ice? @ JTF — Please forgive my saying that your posts are boring. (Likely, you could not care less what I think, but, I still owe you an apology). They are NOT boring to those with the intellectual proclivity for such subject matter or to those for whom the content is intriguing — and that is a LOT of people. These posts are what WUWT is all about, real people, not pretentious people, discussing real issues, without pretension. This is why the warmist websites are doomed. Well done Mods for not snipping it and love the tiny hint of sarcasm! Based upon this I would amend my statement that “the measurement process has been applied consistently throughout the record” to “the data processing methodology has been applied consistently across the record”. “JTF gets an “A” for facts, but a C for writing style, I’m afraid. And I get a C for reading — I just get so BORED with the content that I skim (oops!). Every word is potentially significant. Sigh. I have been considering how to make some of my articles and the WUWT Reference Pages more accessible to less technical readers, and possibly even customizing a few for children. However, I sometimes struggle to synthesize complex subject matter down to bit size nuggets without expressing some form of opinion. I will put more thought into using highlighting and underlining to help call out important points. Please forgive my saying that your posts are boring. (Likely, you could not care less what I think, but, I still owe you an apology). They are NOT boring to those with the intellectual proclivity for such subject matter or to those for whom the content is intriguing — and that is a LOT of people. No worries, I take constructive criticism well. Also, my goal here is to make the facts readily accessible to whoever would like to see them. Thus I will work to engage with broader audiences. Similar to the Arctic, the Antarctic experiences atmospheric oscillations and recurring weather patterns that influence sea ice extent. The primary variation in atmospheric circulation in the Antarctic is the Antarctic Oscillation, also called the Southern Annular Mode. Like the Arctic Oscillation, the Antarctic Oscillation involves a large-scale seesawing of atmospheric mass between the pole and the mid-latitudes. This oscillation can intensify, weaken, or shift the location of semi-permanent low- and high-pressure weather systems. These changes influence wind speeds, temperature, and the track that storms follow, any of which may influence sea ice extent. For example, during positive phases of the Antarctic Oscillation, the prevailing westerly winds that circle Antarctica strengthen and move southward. The change in winds can change the way ice is distributed among the various sectors. In addition, the strengthening of the westerlies isolates much of the continent and tends to have an overall cooling effect, but it causes dramatic warming on the Antarctic Peninsula, as warmer air from over the oceans to the north is drawn southward. The winds may drive the ice away from the coast in some areas and toward the coast in others. Thus, the same climate influence may lessen sea ice in some sectors and increase it in others. Changes in the El Niño-Southern Oscillation Index (ENSO), an oscillation of ocean temperatures and surface air pressure in the tropical Pacific, can lead to a delayed response (three to four seasons later) in Antarctic sea ice extent. In general, El Niño leads to more ice in the Weddell Sea and less ice on the other side of the Antarctic Peninsula, while La Niña causes the opposite conditions. Another atmospheric pattern of natural variability that appears to influence Antarctic sea ice is the periodic strengthening and weakening of something that meteorologists call “zonal wave three,” or ZW3. This pattern alternately strengthens winds that blow cold air away from Antarctica (toward the equator) and winds that bring warmer air from lower latitudes toward Antarctica. When southerly winds intensify, more cold air is pushed to lower latitudes, and sea ice tends to increase. The effect is most apparent in the Ross and Weddell Seas and near the Amery Ice Shelf. As such, yes Antarctic Circumpolar Wave (ACW), in conjunction with theAntarctic Oscillation, ENSO, planetary wave numbers 2 and 3, Eddy Heat, Polar Vorticity and several other factors, likely are responsible for the recent growth in Antarctic Sea Ice Area and Extent. Perhaps someone should send a link for WUWT to Apple CEO Tim Cook. He seems to have a poor understanding of climate science. Done. I sold all Apple stock and I’m going one better. I won’t be buying any Apple products till their attitude changes. 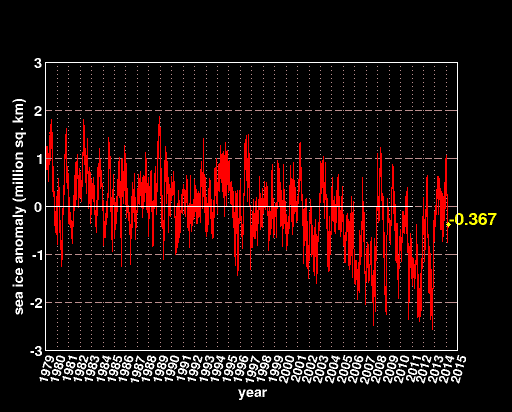 The Antarctic sea ice was knocked down in the second week of February by a shift in the jet stream. The jet stream broke up in sections and then moved away towards the north. It has since closed back closer to the continent. That would be my conjecture from observing the daily jet stream movement and sea ice changes during that time period. I though that it was going to keep tracking high and maybe set a new record, but then the shift in the jet stream occurred. Up north the sst anomalies show a cold stream has broken the northward flowing warm stream in the area of Nova Scotia. Is this going to lead to cooler waters moving into the Arctic in the next 3 to 4 months? A cooler water flow had also pierced the warm flow at the beginning of January, but this time the break is considerably larger and extends across to Europe. This could get interesting. Those papers cited were published in 1996 (and earlier), and their data and analysis was even earlier. Since May 2011, EVERY Antarctic sea ice “season” (Sept-Oct peak, Nov-Dec-Jan melting, Feb-March-April minimum, and May-June-July-August freeze) has been steadily increasing. 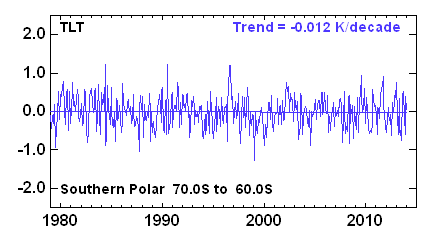 Been steadily “positive” sea ice anomaly increases. Looking back even earlier, the Antarctic sea ice extents have been generally positive – though not as strongly increasing as since May 2011 – since about 2002. Regardless of El Nino, La Nina, or La Nada’s. 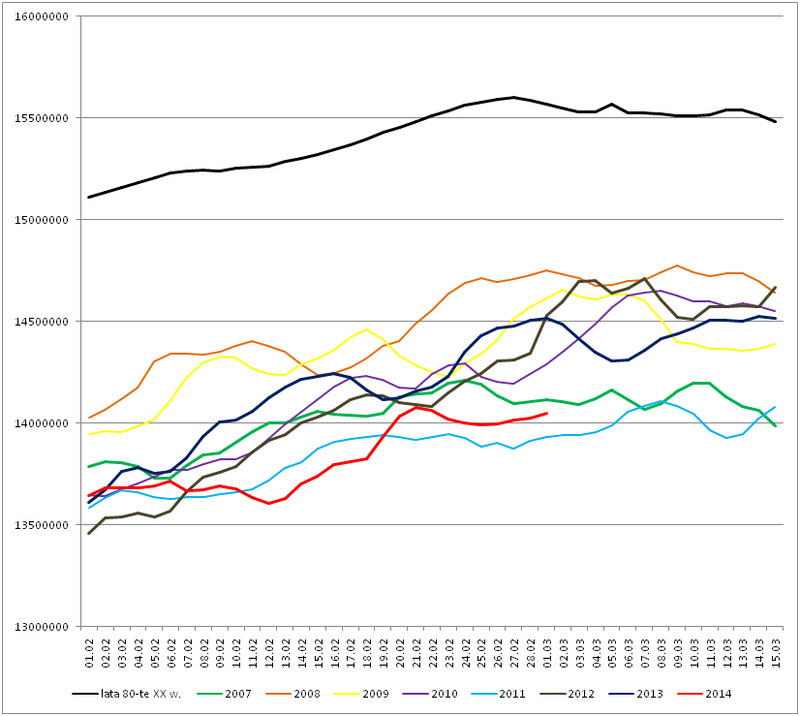 No 3 year lag as claimed just above. Just a long steady increase. No “winds” blowing the sea ice “away” from the continent. No “glacier melt water” diluting the sea water and causing an easier or faster freeze. NASA is pulling a Holdren on this. They cannot accept mentally the blunt error of their religion and the recent facts of Antarctic sea extents growth. Thank you, JTF, for your gracious response to my rude remark. Sigh. Actually, I LIKE children’s books. Sounds like that would be about my speed. JTF — just do your thing. It is OUR (those of us who are non-science majors) job to work a bit harder at mining the gold you present. And it is not difficult, really, i.e., the gold is right there on the surface. Just takes some mental discipline. Thanks for being willing to put in more headings/highlighting key words, etc… . Remember, as I have often been reminded, “THIS IS A SCIENCE SITE.” You are doing just fine. Thanks for the reminder, R. A.. I need to take the time to read JTF’s conscientiously copious compendiums with the care they deserve and always keeping the ultimate goal: truth to combat the l1es of AGW, in mind. I managed to get in a hundred or so comments about the southern situation at multiple media sites here and in the UK during that time. Re: 9:42pm — GO, GOLDMINOR! Way to get the truth out there. Parts of Australia to the east side have already shown below average temps over the last 2 weeks. Only the west side of the continent has been showing high 90s to low 100s. New Zealand has been below average most of this season. It will be interesting to see how the southern sea ice regrowth does. The end of next week might show a first upward shift in momentum. Weather polar vortex 30 km, 6 March. Lock began in the autumn, when in September and October decreased solar activity. Important comment about the Antarctic situation. 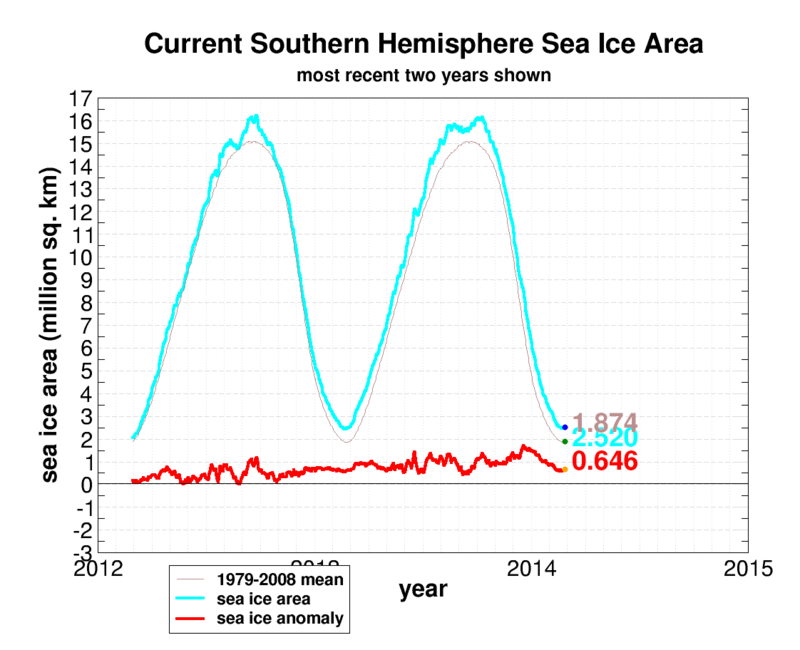 What will it take to get the MSM to notice that the South seas are icing up? Geomagnetic activity cycle 23 and 24. Well ‘Ship of Fools’ failed to do so…. That is unbelievable and significant if true. In ’62 and ’63 there was 3 mths of cold in the UK and the ground froze to 1 foot, however, the temps were not as low as some in the uSA this year. The pdf is interesting. I read part of it, but I have so much to read though. “the data processing methodology has been applied consistently across the record”. 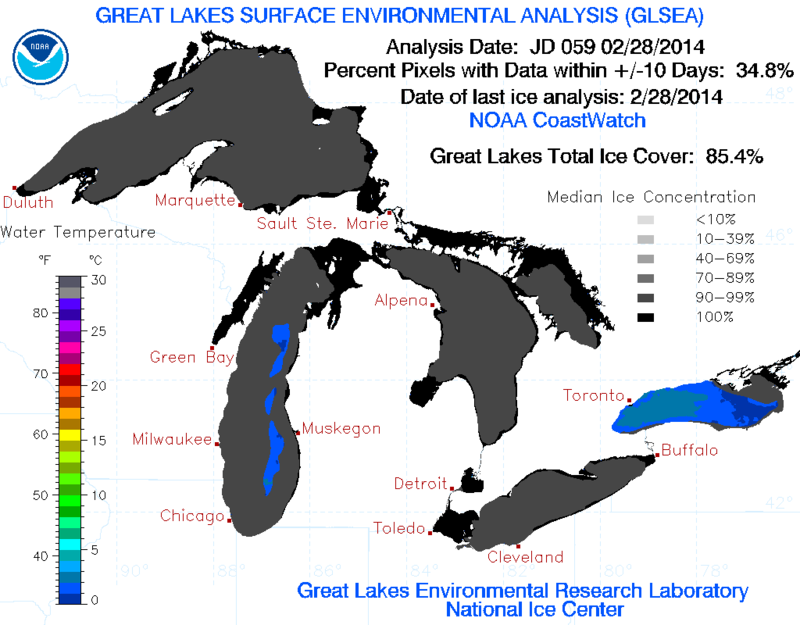 One of the biggest changes they made is how they are now measuring coastal ice, bays, etc…. By including it now…it will show less overall ice…. The “integrated” Arctic Sea Ice status. This is the average ice thickness throughout the years. Note the increase in the average starting in 2014. Just in time for the Polar Vortices. It’s better shows you How does the weak polar vortex. My son, who lives in a town in southern Ontario, tells me the frost line is at 6 feet there. And people have been told to let the water running so the pipes do not freeze. As well, they will not be charged for water this month. 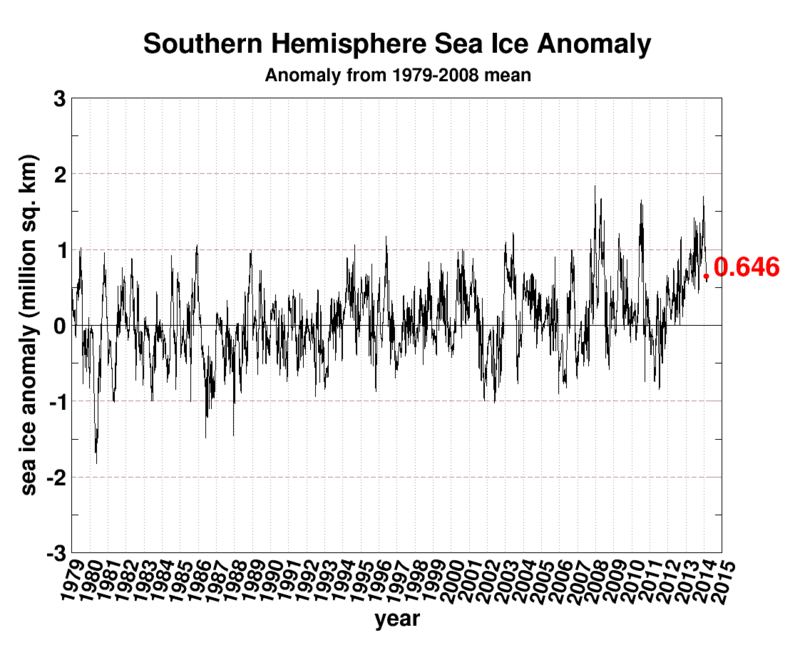 There is another graph from Cryosphere Today that show the historical Antarctic Sea ice area much better. 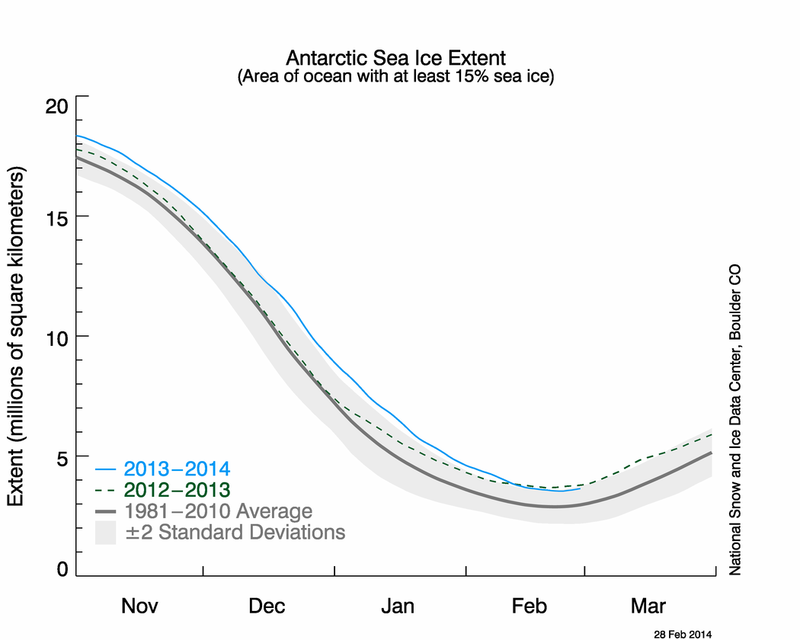 For most of 2014 the Antarctic has been setting records for most ice and no mention in the media about it. It’s fascinating but hardly surprising to see the news blackout on the steady upward trend in southern hemisphere sea ice. It just doesn’t fit the narrative of doom. It’s a big icy elephant in the room. Meanwhile, as sure as night follows day, we can prepare ourselves for the media to be full of doom mongers in the very near future. Northern hemisphere sea ice area is currently at 13.048 million sq/km. It’ll need to go some in the next few weeks if it’s going to reach the record smallest satellite-era maximum of 14.64 million sq/km set in 2006 and 2011. Thanks JTF! I will use your post quotes whenever I am in a discussion with -“We are all gonna freeze because of the Sun and look how much ice there is in Antarctica!”- folks who think the Sun is behind the increased Antarctic ice extent. Not so fast there buddy, lets think this through. If the media go nuts over the lower Arctic ice extent because it is now so hot in the Arctic, then where did all the cold air from the polar vortex come from? If all the cold air from the polar vortex came from the Arctic then would it be logical to think the arctic is now a little warmer? The warmbots will have to mull over this for a while before they issue any directives to the compliant media. 15-year global warming pause, near record high sea ice coverage at Arctic and Antarctica, record low temperatures in many US locations. IMO these are not mere coincidences. 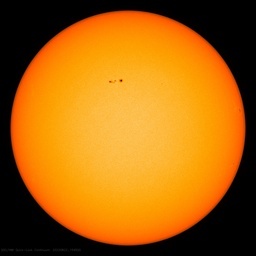 This is what solar physicists call Dalton and Maunder-like minimums for solar cycle 24. Talk about global cooling for a change. 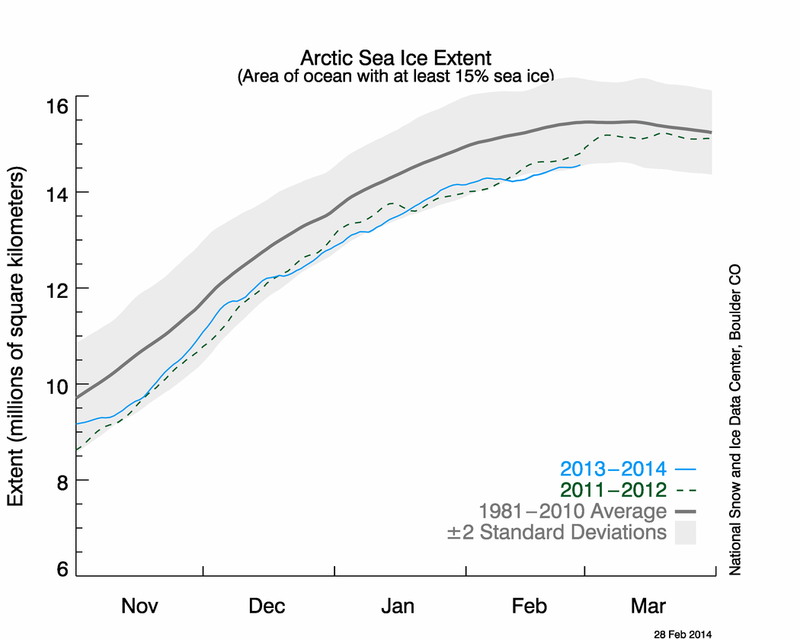 The Arctic sea ice is going to remain at low levels until the Atlantic warm flow tapers off. That may be upcoming in the next 3 months or so. A strong cold sst anomaly has taken hold between Nova Scotia and Europe. This has cut off the constant warm anomaly flow that has been in progress for the last several years. The perfect combination for cooling may well be setting up right now. With the Great Lakes region experiencing such a deep cold, the likelihood of a cold spring and cool summer is high. I imagine that the cold sst anomaly off of Nova Scotia is due to the polar flow crossing eastward after exiting the eastern US. All of the above could lead to a negative shift in the Arctic by the beginning of summer. At the same time the warm pool anomaly in the North Pacific has shed 25% of it,s heat content over the last several weeks. It was at +3.3 and is now down to +2.39. The Bering Sea area now has a cold stream moving into the area off of the east Eurasian coast. That has been gradually displacing the warm sst anomalies over the last 3 months. Alaska has finally seen a temp drop to normal after staying well above average all winter long. All of these changes are going to add up, as this year progresses. We are getting pelleted by crystalline ice particles here in Mid North Carolina. WUWT?!? The forsythia and daffodils are usually out by now. Instead the ground is covered with ice not flowers. The problem with that paper is it uses the mangled ‘Adjusted’ Global temperature (first figure) instead of the raw data therefore the conclusions are incorrect. This is an excellent example of the magnitude of failures caused by Hansen et al.s tampering with the data. Decades worth of ‘scientific findings’ out the window because of these out and out liars and billions of dollars down the drain. Time to cut the funding of science and academia! ICE AND SNOW… Here’s some colorful relief for all you wonderful WUWT readers longing for spring. And this is especially for you, dear Gail. You who do so MUCH for truth in science here on WUWT, here is a BIG DIGITAL BOUQUET of color from me to you. Is there any gold in them thar hills in the background? LOL, nope. And no black gold, “ole, that is,” either. Just a lot of gravel. In fact, there’s a town called Concrete up river a piece from where I grew up… . Thus, in 1890, my great grandfather left the area of them thar hills to head up to the Klondike in Alaska to find some. He did. A nugget the size of his newborn baby’s fist. Hope YOUR ventures all pan out, Goldie.